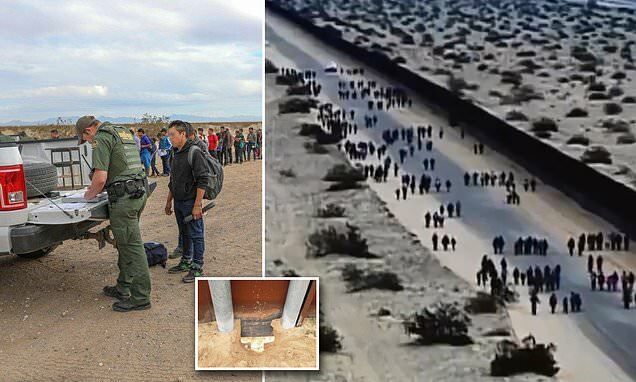 The group of 376 Central Americans 'inundated agents' agents after crossing the border through a series of hasty tunnels near Yuma, Arizona on Monday, Customs and Border Protection said. Officials said that most of the group entered the U.S. through seven small openings burrowed under the border barrier. The crossings took place at a remote stretch of border where old fencing is about 12 feet high and the ground is sandy. Stretched thin, CBP has only three agents patrolling the 26-mile section of border. 'The only thing that solves that problem is a change in the law,' CBP Yuma Border Sector Chief Anthony Porvaznik told ABC News. 'The only reason they're trying to say that they're family units is that they know if they're a family unit, they're going to be released within 20 days,' Porvaznik said.